Jiande Gu and Jerzy Leszczynski and colleagues from Jackson State University and the Chinese Academy of Sciences ran a computational study that revealed that the base-stacking structure of DNA could increase the resistance of the arsenate towards hydrolysis, compared with current arsenate models. ’However, our study also suggested that arsenated DNA (As-DNA) is still less stable than normal DNA when hydrolysis is considered,’ says Leszczynski. ’Normal’ DNA has a backbone made of sugar and phosphate groups joined by phosphodiester linkages. Arsenic replaces the phosphorus in As-DNA. 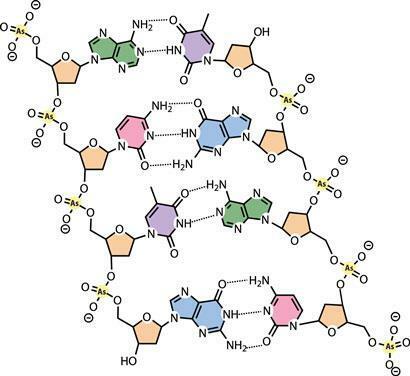 ’The model system we investigated was dinucleoside-arsenate-deoxyguanylyl-3’,5’-deoxyguanosine (dGAsdG) - a basic unit that captures all the vital characteristics of a single DNA strand,’ says Leszczynski. ’Previous theoretical studies were based on arsenate esters and not a reliable DNA unit, and did not include crucial base-stacking and intra-strand hydrogen bonding interactions.’ These interactions could increase the energy barriers of the process, leading to the triangular bipyramid structures of arsenate being formed during hydrolysis of the arsenate diester in As-DNA, says Leszczynski. Lynn Kamerlin, who studies molecular biology at Uppsala University, Sweden, agrees. She adds that although moving from looking at structural features to considering energetics is a step in the right direction, the work isn’t validated against experimental data. ’In fairness to the authors, the fact that there really is minimal experimental data to calibrate against doesn’t make it easier,’ she says. ’Now we’re investigating how inter-strand hydrogen bonding affects the hydrolysis stability of As-DNA. Our results may provide some details of possible modifications of the As-DNA that could increase its stability. This would definitely set off an experimental race to its synthesis,’ concludes Leszczynski.